The St. Paul softball team put up a strong showing in the opening week of the season, winning three of four games last week, including back-to-back wins over the Culver Bulldogs on Thursday. The Buckaroos (3-1) kicked off the 2019 spring season with a 14-4 win over Mohawk on March 11, followed by a 21-0 loss to Western Mennonite on March 13. But the Bucks rallied a day later, emphatically sweeping the team's double-header over the Bulldogs by scores of 21-9 and 27-9. 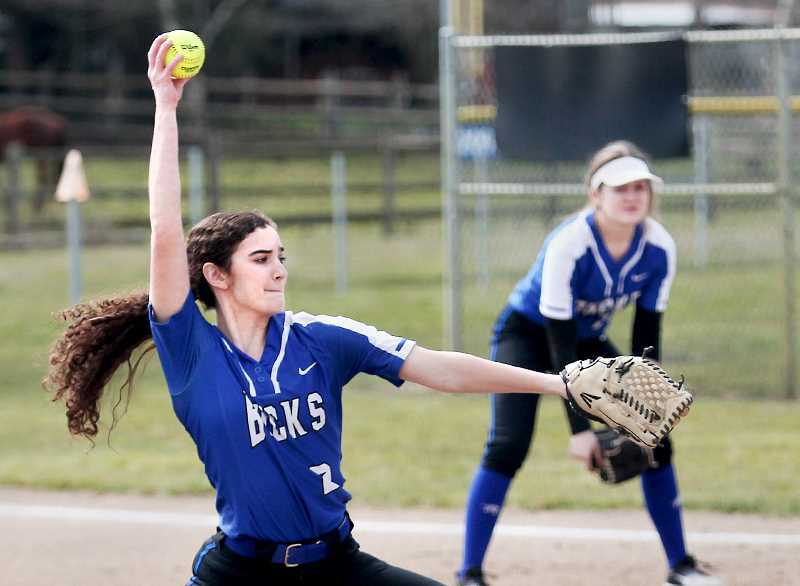 In the season opener, the Bucks rallied from an early 2-1 deficit by posting 11 runs in the bottom of the third, marking the fourth straight year the team has begun the season with a win since St. Paul's softball program began in 2016. Senior Rachel Vela pitched a complete game for the Bucks, striking out eight while giving up six hits and three earned runs in five innings of play. Taysha Veeman opened the floodgates in the third by drawing a leadoff walk and converting it to a run two batters later to tie the game at 2-2. The Bucks took the lead on a fielder's choice hit by Destiney Smith that scored Alex Tegland. After St. Paul notched its second out of the inning, the Bucks went on a nine-run scoring binge that saw Sadie Smith, Karlee Southerland, Jordan Caldwell, Veeman and Tegland all drive in runs. Most of St. Paul's work was without much production at the plate, where the team notched just four hits. But the Bucks drew 10 walks and took advantage of Mohawk miscues to pull out the victory. Vela finished with a game-high four runs scored, while Southerland and Tegland each drove in a pair of runs. The Bucks had a tough time against the visiting Pioneers, which took a 12-0 lead after the first three innings and added eight more runs in the top of the fifth. St. Paul did themselves no favors with four errors and mustered just five hits compared to 14 coming from the Western Mennonite dugout. After falling behind 6-0 in the top of the first inning, the Bucks put up 10 runs in the bottom half of the inning and led throughout the remainder of the opening game of their double-header against the Bulldogs. St. Paul once again chewed up pitches with patient at-bats, drawing 15 walks. Destiny Smith and Tegland each drove in four runs, while Southerland led the Bucks with four runs plated. Jordan Caldwell and Tegland each drew three walks, converting all three into runs. Vela finished two-for-four with three RBIs and two runs scored to go along with pitching the final four innings. The Bucks picked up right where they left off, scoring 10 runs in the opening inning. Although the Bulldogs tried to keep up, scoring five runs in the bottom of the third to make it a 15-8 game, St. Paul responded with 10 more runs in the fourth to effectively put the game out of reach. Megan Tuck, Sadie Smith and Destiney Smith each led the team with five RBIs in the victory.